Background: We are submitting an easy, effective and environmentally benign protocol for the synthesis of 18 different 1,2-dihydroquinazoline derivatives. Methods: We implemented [TMA][OH] ionic liquid mediated hydrotalcite clay catalytic system as a green catalyst to perform this reaction. 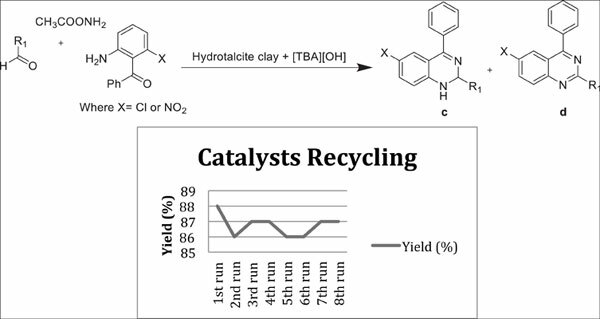 Results: Three-component reaction pathway was utilized to synthesize 1,2-dihydroquinazoline derivatives using aromatic aldehydes, 2-amino benzophenones, and ammonium acetate with green and recyclable ionic liquid mediated hydrotalcite clay catalytic system. Conclusion: The notable highlights of this method comprise short reaction time, operational simplicity, high yields, and high selectivity. Additionally, the catalyst can be recovered and recycled for up to eight cycles without any loss in catalytic activity. 1, 2-dihydroquinazoline, catalysts recycling, heterogeneous catalysis, hydrotalcite clay, ionic liquid, synthesize.